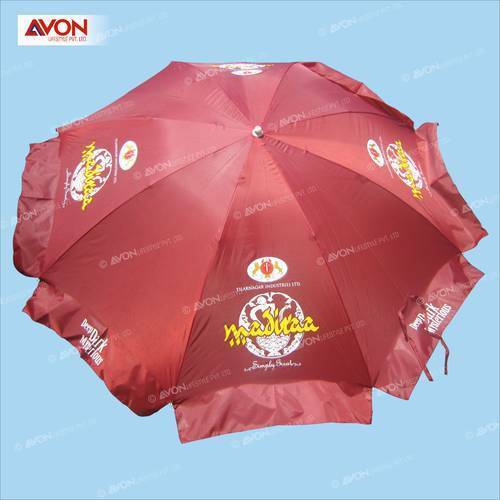 We are well renowned manufacturer & exporter of artistically hand crafted Beach Umbrella which are widely used as sunshade tool in garden and tools. In our range Beach Umbrella, various designs are available in appliqué with glass work and hand work in different color combinations. Packaging Details Our standard packing 50 Pieces can be altered on request. Avon Group, an ISO 9001:2008 company with an annual turnover of (2015-2016) 62 crore founded by Mr. Chandan Parekh in the year 1969 as manufacturers and marketers of Ribs, Tubes and skeletons of Umbrellas. In a decade’s time Avon won the trust of people as a company which was dedicated to quality, commitment & professionalism. Avon having Bi-lateral tie ups with various regional Umbrellas Manufacturer like M/S K.C.Paul & Sons, Mohendra Dutt Group, Sait Nagjee (Sun Brand), John Umbrellas, Ebrahim Currim & Sons (Stag) grew to be one of the most renowned & quality umbrella parts & served the industry for 30 years. In 1999, the company took a major step in extending its business interests as finished Umbrellas manufacturer. The new unit headed by Mr. Sanjay Parekh, under strategic policies and business dimensions got itself established with manufacturing Umbrellas for Corporate Companies like Piramal Healthcare, Glenmark, Pfizer, Blue Cross, Vodafone, Hindustan Lever, Castrol, Escan, Urban Clap Total Lubricants & many more. After carving a niche in the corporate world, AVON now has stepped into the retail market with their brand name “FENDO” Umbrellas in the year 2012 with a unique, fancy & high quality product range of Umbrellas for (Men, Ladies & Kids) in the Consumer Market. A bulk order of 9 Lakh Umbrellas to Hindustan Lever (Close-up & Pepsodent Products). For last 4 consecutive years supplied around 5 lakh pieces to Vodafone Essar Ltd.
For last 2 years supplied 1 lakh pieces for Castrol India Ltd.
For last 2 years supplied around 50 thousand pcs for PCI. 60 thousand pcs for Loreal-India Pvt. Ltd. for their various brands. Avon also participates & supplies huge quantity for Government Tenders every Year. 60000pcs of Duffle & Trolley Bags to Pantaloon Retail Ltd.
2 lakh Bags for Anchor India Ltd.
40000 shopping bags for Loreal-India Pvt. Ltd. Your number one source for all Promotional Umbrellas and Customised Travel Luggage. We’re dedicated to giving you the very best of our products with a focus on three characteristics, i.e. dependability, customer service and uniqueness. Avon Group delivery centers are strategically located to manage seamless deliveries to Mumbai City (Bombay), Bangalore, Pune, Kerala, Chennai, Gujarat, Delhi, Kolkata, Hyderabad, Manipur, Bihar, Madhya Pradesh, Assam & many other cities towns in India. Owing to our various delivery centers quick transportation facility, we are capable of delivering our products to the customers.